Haggis is a dish containing sheep's 'pluck' (heart, liver and lungs), minced with onion, oatmeal, suet, spices, and salt, mixed with stock, and traditionally boiled in the animal's stomach for approximately three hours. Haggis somewhat resembles stuffed intestines (pig intestines otherwise known as chitterlings), sausages and savoury puddings of which it is among the largest types. Most modern commercial haggis is prepared in a casing rather than an actual stomach. There are also meat-free recipes for vegetarians. The haggis is a traditional Scottish dish memorialised as the national dish of Scotland by Robert Burns' poem Address to a Haggis in 1787. Haggis is traditionally served with "neeps and tatties" (Scots: swede, yellow turnip or rutabaga and potatoes, boiled and mashed separately) and a "dram" (i.e. a glass of Scotch whisky), especially as the main course of a Burns supper. However it is also often eaten with other accompaniments, or served with a whisky-based sauce. Haggis is widely available in supermarkets in Scotland and other parts of the world all the year round, with cheaper brands normally packed in artificial casings, rather than stomachs. 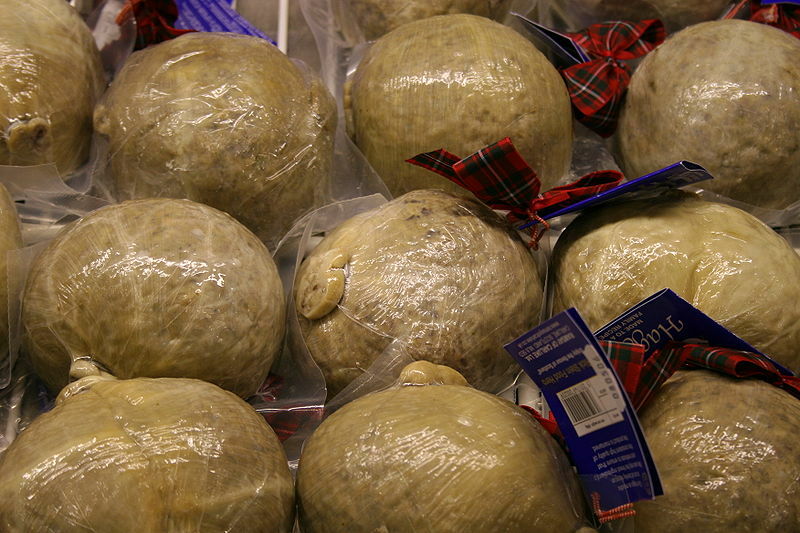 Some supermarket haggis is largely made from pig, rather than sheep, offal. Left: Haggis, neeps & tatties. Haggis can be served in Scottish fast-food establishments deep fried in batter. Together with chips, this comprises a "haggis supper". A "haggis burger" is a patty of fried haggis served on a bun, and a "haggis bhaji" is another deep fried variant, available in some Indian restaurants in Glasgow. Higher class restaurants sometimes serve "Chicken Balmoral" or "Flying Scotsman", which is chicken breast stuffed with haggis and sometimes also wrapped in bacon. Haggis can also be used as a substitute for minced beef in various recipes.